Font Awesome 5 breaks backwards compatibility with Font Awesome 4 by changing both the prefixes and the names of certain icon classes. UberMenu 3.4 updates to Font Awesome 5. Therefore customers who have previously set Font Awesome 4 icons will have saved classes that are no longer Font Awesome 5-compatible. If you have never had an earlier version of UberMenu installed, or did not set icons prior to updating to UberMenu 3.4, you can disable the Dynamically Convert Font Awesome 4 Icons to Font Awesome 5 setting and ignore this document. Please note this guide pertains only to icons set in the UberMenu “Icon” setting. If you have added icons via custom HTML within your UberMenu, you will need to update those classes manually. When you first install UberMenu 3.4, you’ll automatically be updated to Font Awesome version 5. 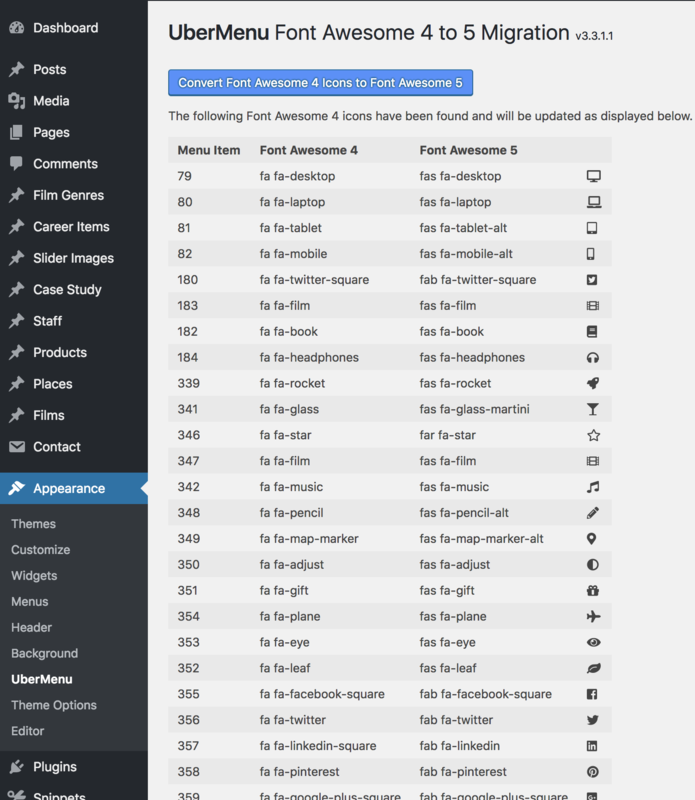 UberMenu will automatically dynamically convert all of your Font Awesome 4 icons to Font Awesome 5 when loaded. This means the update should be transparent and all icons should still work upon updating. To disable the dynamic updating, either because you have converted all your classes permanently, or you wish to use the old classes, you can disable the Dynamically Convert Font Awesome 4 Icons to Font Awesome 5 setting in the UberMenu Control Panel > General Settings > Font Awesome. 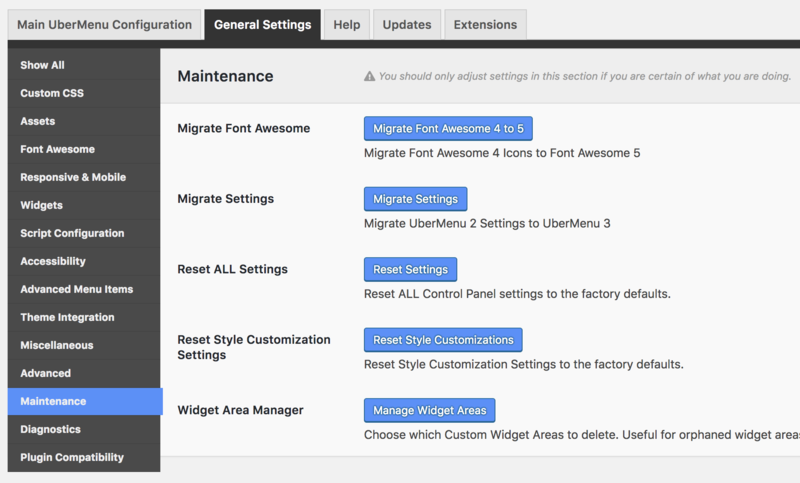 In order to permanently convert all Font Awesome 4 icon classes to Font Awesome 5, you can use the Font Awesome 4 to 5 Migration Tool. Click the blue button to complete the icon class migration. When finished, you’ll see a report of the updated icons. If you have no icons to convert, you’ll receive the message “No icon conversions necessary”. When all your icons are converted, you no longer need the Dynamically Convert Font Awesome 4 Icons to Font Awesome 5 setting, so that can be disabled. If you have set custom icon styles in UberMenu or UberMenu – Icons Extension, you may need to re-save the settings in the Customizer to regenerate the new styles. If you have written custom CSS for icons, those icons still have the same class, .ubermenu-icon. Your code should still apply, but may require tweaks in some cases. Tip: don’t use padding on SVG elements. If you have written custom CSS for the submenu indicators, these have changed from pseudo-elements to normal icons (in order to support SVG). Therefore you’ll need to adjust any CSS from the :after pseudo-selector, to the .ubermenu-sub-indicator class. As Font Awesome 5 is adopted by more and more themes and plugins, there will inevitably be some growing pains, due to the backwards compatibility issues, and different components running different versions of Font Awesome. 2. If you have Font Awesome 4 icons on your site that are not displaying, adding this CSS will likely resolve it until you update them to Font Awesome 5. 3. In the long run, you will want to convert your icons to Font Awesome 5. Not all plugins/themes may have an auto-convert utility. 4. Using the Font Icons option will provide the best compatibility. But if you’re running the SVG JS anywhere on your site, it’s going to change all Font Awesome icons to SVG regardless. 5. If you want to maintain your UberMenu Font Awesome 4 icons for the time being, you can disable the Font Awesome 5 assets, and disable the Dynamic Conversion option. However, if you select new icons, they will only be Font Awesome 5-compatible.